With 175 AKC dog breeds in 2012, choosing a dog for yourself can be hard. Learn how to choose and find detailed breed info and descriptions to help. Before choosing from so many breeds, you should be clear on what role the dog will play in the life of your family. A new dog should add value to your family rather than robbing you of precious time, peace of mind, and money. After studying the questions below, take a look at our list of breeds for in depth information on any and all you may be considering. To learn about choosing the right breed, read on. For detailed information on individual breeds, visit one of the following lists in the box below. * Will the dog be primarily kept inside or outside? Some dogs have an abundance of energy and will need a regular opportunity to run outside without wearing a leash. If you live in an apartment, certain breeds make good apartment dogs and some do not. Small breeds make some of the best apartment dogs. Dogs who do not get proper attention may tend to act out, be destructive, or become irritable. * Is anyone in the home allergic to dog hair? The hair from some dogs produces strong allergic reactions in sensitive people while other “hypoallergenic dogs” affect very few animal allergy sufferers. 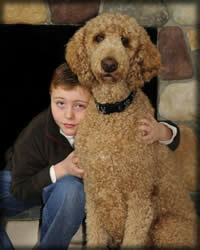 Examples would be Poodles and Poodle mixes, as well as other mix dog breeds or hybrid dogs. * Will the woman of the family be the primary care provider of the dog? Certain dog breeds, such as the Bishon Frise, tend to attach themselves to the head female of the home. Even if she already has an abundance of other family responsibilities, she will be the one the dog looks to for care and attention. Small breeds are most commonly chosen as travel companions, while mid-sized breeds may also be in this category, although it is not as likely. Ease of transportation is a key factor when it comes to travel, especially air travel. * Will grooming expenses be a burden on the family budget? Longer haired breeds must have their coats maintained regularly to prevent matting, which can be uncomfortable and painful for the dog in addition to being unsightly. Some “hypoallergenic dogs” do not have fur that sheds. Instead, they have hair that grows and must be periodically cut. This helps allergy sufferers, but it does require extra maintenance. * Will the dog be used for sporting purposes? Certain sporting dogs or “gun dogs” have a strong desire to track, hunt, burrow or retrieve. chosen for hunting purposes. Dogs in the Spaniel family commonly fall in this category, such as the English Springer Spaniel, as well as pointers and retreivers such as the German Shorthaired Pointer or the Labrador Retriever. * Will the dog be used as a protector or guard dog? Certain large breeds such as the German Shepherd, Saint Bernard, and Newfoundland are natural protectors and nurturers. Breeds such as Rottweilers can make excellent guard dogs but can also have sweet temperaments if they are properly nurtured. * Will veterinary expenses be a burden? Dog health problems are more common in some breeds than in others, including problems with hips, spinal issues, and other medical ailments that may need advanced medical assistance as they age. * Are there other pets in the home that will be affected by the addition of the dog? Some breeds do not get along with other breeds. Also, it wouldn’t be fair for a bird dog to live with birds. If you think the domestication of these animals erases any of their God-given instincts, it doesn’t. * Will the dog be used for breeding or showing purposes? If you want to breed your pet dog, you should talk with several breeders to gain an understanding of the concerns you may encounter. 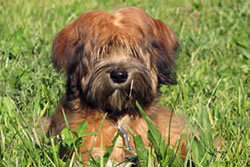 If you plan to show your dog, go to several dog shows and ask for advice from the owners of breeds you are considering. * Will the dog need to adapt well to children? Even if you do not have children, will children ever likely be coming into your home? Certain dogs are simply not well-suited for children, while others are most excellent and tolerant of the unpredictability that surrounds small children’s lives. *What’s the best family dog? This is a very common question, and the answer depends a lot on your family. Here are three things to consider: 1) Review the information on this page (the page you are on now); 2) Learn about specific breeds by visiting our list of breeds to discover what breeds may fit well with your family; 2) Read the best family dog article. Important Note: The information presented within this website is general in nature and is not a guarantee that all dog breeds will display the same personality or physical characteristics of another, similar breed. Physical characteristics will vary depending on the dog’s parents and their personalities will often differ depending on who is raising them and in what environment they are raised, including the other dogs, pets or animals.